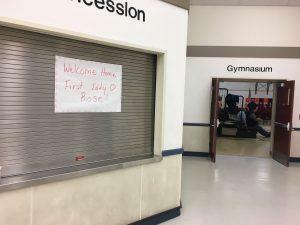 A sign welcoming Rose Dunleavy back to her hometown of Noorvik, where here husband, Gov.-elect Mike Dunleavy, is scheduled to be inaugurated Dec. 3, 2018. KTOO & Alaska Public Media: The swearing-in for Mike Dunleavy as governor and for Kevin Meyer as lieutenant governor is scheduled for just before noon today. Dunleavy is scheduled to fly directly from Anchorage to the Northwest Arctic Borough village of Noorvik for the ceremony. It’s where Dunleavy’s wife Rose grew up.